Blues guitar simply would not have developed in the manner that it did if not for the prolific brilliance of Lonnie Johnson. He was there to help define the instrument’s future within the genre and the genre’s future itself at the very beginning, his melodic conception so far advanced from most of his pre-war peers as to inhabit a plane all his own. For more than 40 years, Johnson played blues, jazz, and ballads his way; he was a true blues originator whose influence hung heavy on a host of subsequent blues immortals. 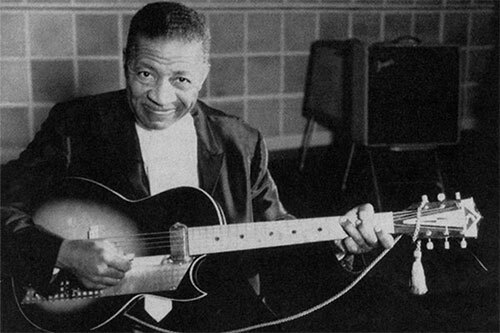 Lonnie Johnson was born in New Orleans on February 8, 1899, one of a family of 13 children. His first instrument was violin, but while playing in his father’s string band he became proficient on guitar, mandolin, banjo, string bass, and piano. He toured England in 1917 as part of a musical revue sent over to entertain the troops. When he returned to New Orleans he found his entire family, except for his mother and older brother (James “Steady Roll” Johnson), to be wiped out by the 1918 influenza pandemic. Johnson moved to St. Louis with his piano-playing brother, and performed on the riverboats as a member of Charlie Creath’s Jazz-O-Maniacs. He won the blues contest 18 weeks in a row at the Booker T. Washington Theatre, which gained him a recording contract with Okeh Records—with whom he released his first single, “Mr. Johnson’s Blues,” in 1925. Between 1925 and 1932 Johnson cut an estimated 130 songs as a leader. He was a guitar legend before the term “guitar legend” was coined, appearing on landmark tracks such as Louis Armstrong’s Hot Fives and Duke Ellington’s “The Mooche.” In 1928 Johnson recorded a series of duets with white jazz guitarist Eddie Lang, since titled “Blue Guitars,” which are still revered today as the most inventive and groundbreaking instrumentals of the fledgling jazz era. The list of artists that Johnson recorded and toured with during that time period is astounding: Bessie Smith, Big Bill Broonzy, Roosevelt Sykes, Peetie Wheatstraw, Charlie Christian, Johnny Dodds, King Oliver, Kid Ory, Victoria Spivey, Texas Alexander, Helen Humes, and on and on and on. In the late ’30s, after enduring the Great Depression and moving to Chicago—and following a seven-year absence—Johnson resumed recording for the Bluebird label. His career once again skyrocketed with songs such as “He’s a Jelly Roll Baker” and “In Love Again.” In 1947 he recorded one of the biggest hits of his career, “Tomorrow Night,” for King Records. Later, B.B. King, Elvis Presley, Jerry Lee Lewis and countless others paid tribute to Johnson with heartfelt renditions of the song. The 1950s were a rough time for Johnson, and by the end of the decade he was working as a hotel janitor in Philadelphia. It was there that banjo player Elmer Snowden came upon Johnson and alerted famed music journalist Chris Albertson, which led to a series of albums for the Prestige Bluesville label. Once again a major comeback was on its way, just in time for the folk Blues explosion of the early 1960’s. 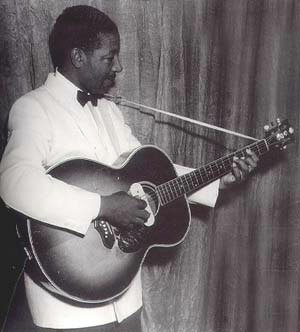 Johnson performed throughout Europe as part of the original 1962 American Folk Blues Festival Tour and played once again with Duke Ellington at New York’s Town Hall. In 1965 Johnson moved to Toronto and opened his own “Home of The Blues Club,” continuing to play music and inspire younger musicians until his death in 1970.